Home > Technology > GOOGLE VS APPLE – WHO PAYS MORE? Being the undisputed kings of the internet and consumer electronics, one would expect there to be some very competitive salaries on offer at Google and Apple. In order to attract top talent and maintain their position at the forefront of their respective industries, packages need to be put together to draw in the highly skilled, creative and forward thinking employees that Google and Apple aim to secure. Salary data compiled by Glassdoor.com based on anonymous reports that are voluntarily shared by employees give some insight into what one would expect to earn at these global giants. The figures comprise of base salaries and exclude any bonuses or other benefits. Based on the figures, not only does Google offer an enviable work environment and the prestige of being part of something amazing, they also incentivise staff by offering handsome remuneration. Much more handsome, it would seem, than Apple. 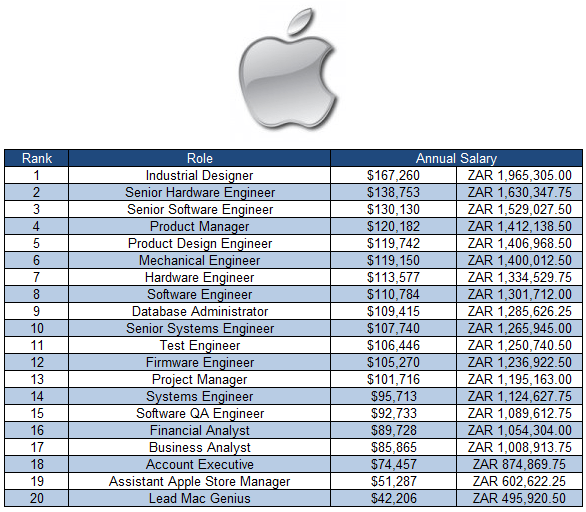 GOOGLE VS APPLE : The highest paying job at Google listed on Glassdoor (this obviously excludes all executive director roles and is purely based on what is reported anonymously) is the role of a Financial Director. An FD at Google takes home a reported $339,009 a year. That’s R3.98m at todays spot USD/ZAR rate of 11.75. Not too shabby! While the data doesn’t compare apples with apples (excuse the pun) as not all roles are comparable and the data is based voluntary submissions, there are a couple of titles that overlap and Google definitely seems to be the place to be if you are chasing the big bucks. 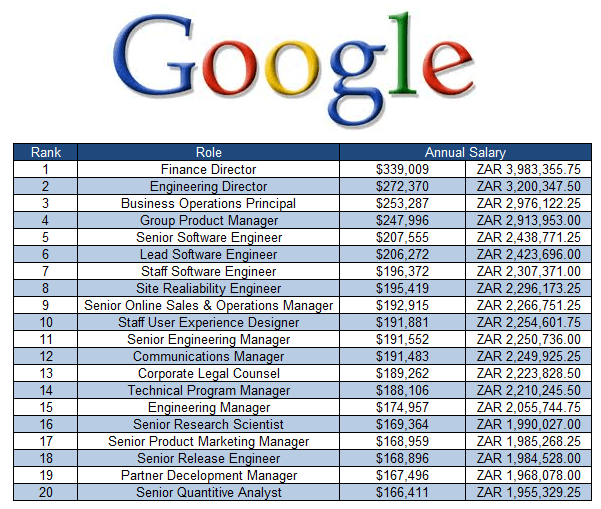 For example, a Senior Software Engineer at Google takes home $207,555 whereas the same role at Apple pays $130,130. That’s an extra 59% if you land the job at Google. Perhaps it is Apple’s apparent salary stinginess that helped them report the largest corporate profit in history ($18bn) at the end of January. It’s no secret that a company’s most valuable assets walk out the door every day, something that perhaps Google take more literally than Apple. Ez Financials Content Manager and Business Financials and Wealth contributor.